There’s an old adage: it’s not the falling that hurts, it’s the landing. There’s something to be said for this, especially with something like bouldering where falling off is almost as much the point of the exercise as success! So you’d better make sure you’ve got the right thing to land on. Sure, you could go old school with your small scrap of carpet, like those old Bleausards but if you look carefully, you’ll notice that walking doesn’t come that easy to these guys any more so maybe investing in a bouldering pad might be a better idea. But with such a bewildering range available these days, how do you know what to look for? The simple answer would be to list you the best pads available at the moment but the fact is that, with the market changing hugely on a seasonal basis, this would offer little. 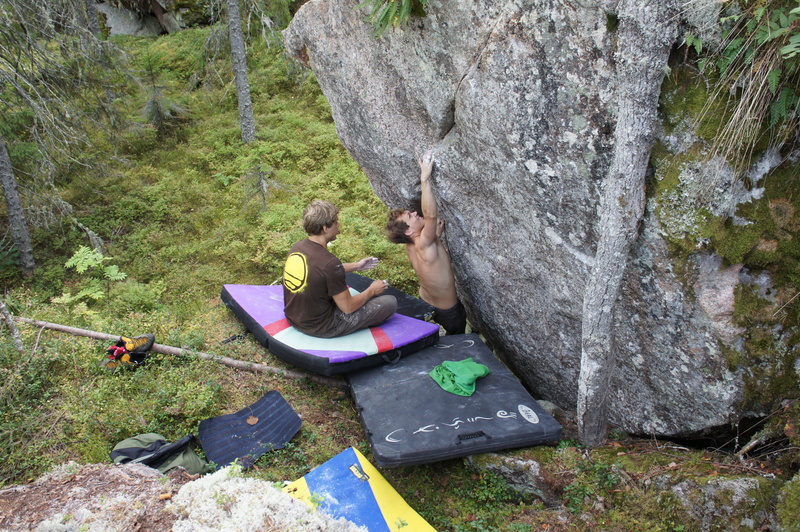 So the plan is to talk through the different features and make-ups of bouldering pads to allow you to go anywhere and figure it out for yourselves. Because, to be honest, once you know the ins and outs, it’s not actually that hard! And i’ll point out some examples along the way to give you something to look out for. Some aspects of pads are pretty obvious so let’s start here. The whole point of a pad is to have something substantial to land on! So we’re going to need some good quality foam in that pad. Open Cell Foam – this one is soft and spongy and absorbs the force. Closed Cell Foam – this one is tough and dense and dissapates the force. Some pads (like the DMM pads) have three layers with the soft open foam sandwiched between two dense closed foam sheets, which can dissipate force from anything sharp underneath. Others (like the Snap Wrap pad) utilise air into the equation but these are more exceptions – most pads will be twin-layer. If it is twin layer, make sure you’re landing on the dense foam or you will ground out. How can you tell if the foam is any good? Well, to be honest, unless you’re an expert in distinguishing open and closed cell foams, you’re probably not going to know by looking or feeling them, but the internet is full of people’s opinions and while i don’t normally advocate looking at reviews, in this case places like forums are a good place to find out a general consensus. In general, though, most climbing manufacturers pride themselves on good reputations so as long as you go for an established, reputable brand, you’ll probably be okay. Get it out in the shop, have a jump up and down on it (with your shoes off) and ask their advice. If they won’t let you in the shop, leave. You’ll also want a good covering fabric. This one is a little more obvious and a bit more up to you. Carpet has it’s advantages, in that it’s good for cleaning the soles of your shoes, nylon is tough and durable and doesn’t hold dirt and crap as much. After a quick feel, you’ll get the hang of what’s good and not so good. Then there’s the size but this is obvious. A bigger pad will cover more area but will be bigger to carry, heavier and dearer. Try and get the biggest you can, as they look a lot smaller when you’re above them but be sensible – a small pad that fits in your car is much better than a big one that doesn’t, for example! 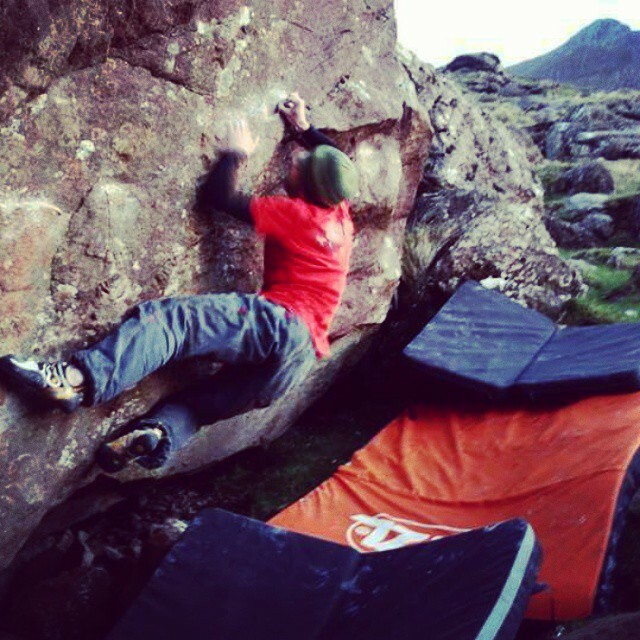 Don’t get confused by the thickness though: thicker pads, while they may be fractionally better to land on from height, they are much heavier to carry and for most bouldering falls, in my experience, the difference will be negligible or non-existent compared to two stacked pads. There are some aspects that all pads share. The corners get a bit of a beasting so something that is reinforced with rubber will be better in the long run. The more expensive pads often have rounded corners, which will also take more abuse before wearing through. Check the buckles are solid (again, this should be common sense) and the materials attached to them aren’t likely to break. Most buckles will be metal, plastic or velcro – the latter not ideal if it’s going straight down in the dirt. Lastly, the zips. Yes, your new pad will have a zip along there somewhere, to allow you access to the foam. It’s worth unzipping it slightly to check out the foam inside and while you do, find out which side the zip sits. If you imagine a rectangle with two distinct lengths, you want the zip to be on the longest side. This allows you to take the foam out, either for cleaning or even for drying once you’re inadvertently put your pad in a puddle. So, the different make ups. You’ll have seen plenty of these already so it shouldn’t be that new. My personal favourite. These are the ones that curl in half and will spring back open if not tied shut and kind of look like a taco. They allow you a bit of room inside for stashing stuff, they don’t have a soft spot in the middle where a hinge would sit and these days, more and more of them (see the Petzl Cirro/Alto and the Snap Bun) go with the inside down, keeping your back and car a bit cleaner. There are obviously downsides though. They do have a tendency to hold their shape over time so are best stored open but this means they take up a lot of room. For me, it’s a sacrifice worth making as they work much better when you’re actually using them, which is kinda the whole point. I used to split these into two categories: straight hinge and diagonal hinge. The latter is almost exclusively used by Metolius on pads like their Boss Hogg and alleviates the soft spot in the middle, but only when on flat ground. Chuck it in a gully or a trench and it’ll fold up around you all the same. These pads are much cheaper to make, meaning they’re often cheaper to buy and are still very popular. I’ve only owned one and that was a Boss Hogg which i do like in certain circumstances (flat landings mainly) and they are generally easier to pack up and carry, as you’re not fighting the pad to keep it shut. These are much more popular in Europe and consist of three pieces of foam that unfold to give a huge surface area. It’s a very good way of covering a lot of floor without dragging in multiple pads. You’ll see a lot of Beal pads in Font, for example. Ocun are developing more of a market share and in 2015 i saw a novel pad with a zip hinge, called the Moonwalk. It had the versatility to be big and square or long and thin – very handy for sleeping on or traverses! Still, it has the same disadvantages as the other hinged pads. Things move on quickly in this industry so by the time you’ve read this, there may be something new out there. Be cautious of new things until they become established but keep an open mind – everything that is good was new at some point. Now, if you’ve been shopping around already, you might have found some that look the same, but are a lot cheaper. Beware: these may be what i call supplementary pads. These are pads that are much thinner, not really substantial enough to take a proper fall but ideal for something like a sitting start of a tricky low move on a traverse, freeing your main pad for the difficult ending where you really need it. They often fit inside a taco pad, allowing you to take two instead of one, thus vastly increasing the amount of floor you cover. They are useful but not on their own. This is a big feature i look for when buying a pad – it can even be a deal breaker! 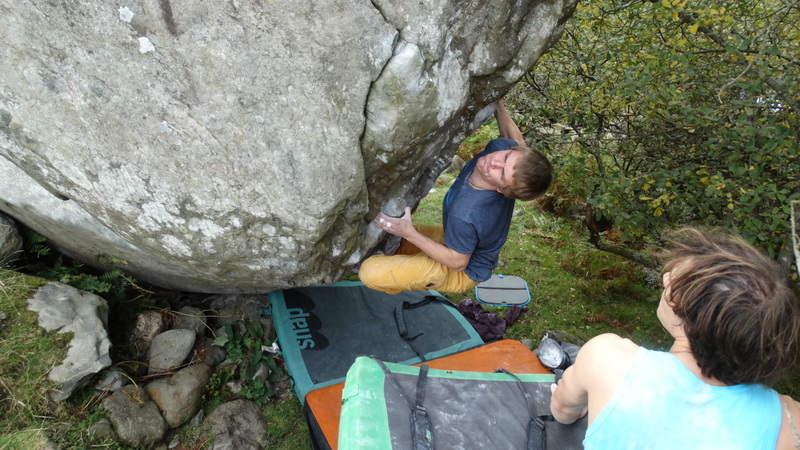 Take the DMM Highball for example, an incredibly popular pad locally in North Wales and yet a pad i will never buy. It’s big, it’s thick, it’s good quality and all other wonderful things but it has no waistband. For me, that’s the big deal breaker. These things are heavy, especially once you load up you shoes, chalk bags, camera, guidebooks and so on and walk for a few miles up a big hill. Do not underestimate how much difference good carrying straps can make. The best out there (at time of writing) is undoubtedly the Petzl Cirro or Alto. These have got massive shoulder straps to spread the load, a velcro closing mega waistband and even a chest strap. I’ve been using mine for a little over a year and while it weighs a tonne, it’s worth it. So take a look at the way it carries and find out if it works for you. 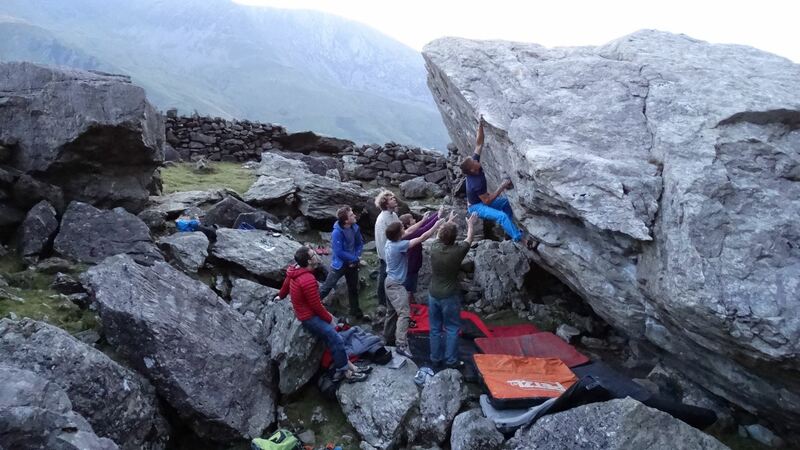 Everyone has a different system – whether that’s travel light or take it all, roadside only crags or mega walk-ins – so make the best judgement for what you’re doing. Yeah, be careful with these. “Wow, this one has a zip pocket!” will probably only be opened in the shop. A snazzy design will look great from above but will soon look a lot worse if you’ve bottomed out through the foam and are now lying on it in a crumpled heap. And remember that bones don’t heal any quicker if they’re landed on pink nylon. Don’t get me wrong, if there’s nothing to chose between them, go for the one that looks the best! But don’t let it distract you from going for the best pad you can get. And with that, i’ll leave you to go shopping! If you have any questions, queries or burning needs to have an explosive rant at me from anything you’ve read, feel free to e-mail me at chezdelabloc@gmail.com or leave a comment and i’ll get back to you as soon as possible.